The pitch of a sound is determined by the frequency of the sound. Normally we refer to its pitch. Frequencies are grouped as .. Midrange frequencies give sound its energy. Humans are most sensitive to midrange frequencies. High frequencies give a sound its "presence" and life like quality. Presence of a sound enables us to hear it clearly and gives us the feeling that we are close to its origin. Timbre is that unique combination of fundamental frequency, harmonics, and overtones that gives each voice, musical instrument, and sound effect its unique coloring and character. When a object vibrates it propagates sound waves of a certain frequency. This frequency, in turn, sets in motion frequency waves called harmonics. The basic frequency and its resultant harmonics determine the timbre of a sound. The greater the number of harmonics, the more interesting is the sound that is produced. It is an object's ability to vibrate and set up harmonics that determines the pleasantness of the resultant sound. Crystal glass set up harmonics that are more pleasant than harmonics of ordinary glass. The combination of fundamental frequency and its harmonics is a complex wave form. The loudness of a sound depends on the intensity of the sound stimulus. A dynamite explosion is loader than that of a cap pistol because of the greater amount of air molecules the dynamite is capable of displacing. Loudness becomes meaningful only if we are able to compare it with something. The sound of a gunshot may be deafening in a small room, but actually go unnoticed if fired in a subway station when a train is roaring past. When two sounds, a bass sound and a middle range sound are played at the same decibel, the listener perceive the middle range sound to be louder. This is why a clap of thunder in a horror movie may contain something so unweatherlike as a woman's scream. Rhythm is a recurring sound that alternates between strong and weak elements. Wooden pegs, suspended by wires in a wooden frame to suggest the sound of a large group of people marching in order, will be believable if correct rhythm is supplied. If the rhythmic cadence were ignored the wooden pegs would sound like wooden pegs drummed mechanically on a wooden surface. An envelope of sound is composed of a sound's attack, sustain, and decay. Sound begins at A and reaches its peak at level B. It drops slightly in level and remains steady until C.
When the sound source is removed at C, the sound decays to a point of silence D.
The way a sound is initiated is called attack. The closer the attack of a sound (A) is to the peak (B) of a sound, the faster its attack is. Sounds that have a fast attack are.. Sounds that have a slow attack take longer to build to the sustain level. The entire thunderclap has a time span of approximately five seconds. By starting the sound at point A, the audience is prepared for the impending thunderclap. To have a frightening sudden clap of thunder, the slow attack has to be changed to a fast attack. Once a sound has reached its peak, the length of time that the sound will sustain is dependent upon the energy from the source vibrations. When the source sound stops, the sound will began to decay. Manipulating the sustain time of a sound is yet another way of either modifying a sound or create a totally new one. The end of a sound is often referred to as the "tail" of a sound, and conversely, the beginning of a sound is its "head"
By increasing or decreasing the playback speed you can change the properties of a sound effect. Played at twice as fast as the recorded speed .. 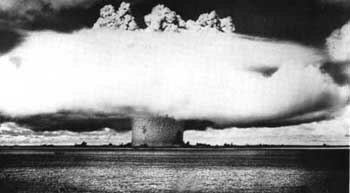 The accompanying sound should convincingly match the magnitude of the explosion and the seeming deliberate amount of time it take for the cloud to take shape. Microphones, located many miles from the site of an atomic detonation, are unable to compensate for their distance to the subject. As a result, the sound of the explosion is little more than a rumbling, irritating, hissing noise with no explosive attack. the loudness or the attack? the inordinately long sustain and decay? In utilizing the components of a sound to create other sounds, the step that must be taken is disassociating the names of the sound with the sounds themselves. Although there are millions of names for sounds, the sounds themselves all fall into certain frequency parameters that can be manipulated by the nine components of sound. Because this sound offer no identification other than a constant roar it can readily be adapted for other sounds. When a believable sound is matched to a picture there is never any doubt in anyone's mind that the sound is not authentic. If the sound is a shade to fast or slow, it will cause many viewers to think that "something" was not quite right. Not one viewer, not one critic, not even the scientists who actually developed the bomb complained about this odd mixture of sounds when they appeared on the TV news in the early 1950s. What everyone heard matched convincingly the picture. One aspect of this audiovisual phenomena is synchresis. 1. A record was slowed from 78 rpm to approximately 30 rpm. The basic principle behind this is to slow a sound to the point where it is basically a tone of indistinct noise. p 53 -70 "What is a sound effect?"